In order to maintain the sanctity and proper condition of the Redemptorist Cemeteries, the following Rules and Regulations have been adopted. All activities within any of the Redemptorist Cemeteries shall be subject to these Rules and Regulations and such amendments and additions thereto as shall be adopted by the Cemetery Management from time to time. Fresh cut flowers or artificial arrangements, not contained in permanent vases or appropriately attached to the monument or marker will be removed two weeks after each legal holiday, including Mother’s and Father’s Days. Flowers and other remembrances may not be placed on the ground during the lawn maintenance program (March 1st thru October 31st). 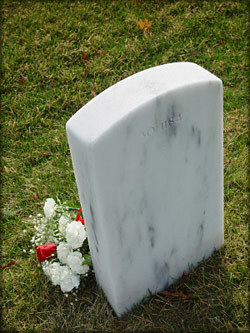 The cemetery or the mowing contractor is not responsible for any item placed at the gravesite. Individual plantings or shrubs, trees, flowers, etc. on cemetery grounds are prohibited and subject to immediate removal by the cemetery. Other decorations, such as glass containers, glass vases, votive lights and candles, etc, are prohibited and subject to immediate removal from cemetery grounds. Seasonal artificial arrangements are available at our office or by calling a Family Service Associate at 410-284-0648.